The mysticism of George Gurdjieff: The philosopher from Kars who developed "the fourth way"
With these few sentences, George Gurdjieff described his own life, one of constant change on the road of personal awakening. Although not particularly well known on the scale of many later gurus and spiritual leaders, Gurdjieff was a highly respected mystic in certain artistic and scientific circles during the early years of the 20th century. The story of Gurdjieff’s quest for self-awakening started in his early childhood in the city of Kars, which was under the rule of the Russian empire from 1878 to 1918. Kars and the Kars Province, a beautiful steppe region surrounded by high mountains, was home to a huge mixture of ethnicities, beliefs, and cultures: Armenians, Russians, Caucasus Greeks, Georgians, Turks, Kurds, Caucasus Germans, and Estonians. Living amongst this depth of diversity made the people of Kars open to travelers and mystics and respectful of different kinds of religious preachers. Growing up in this environment definitely made Gurdjieff curious about many things. Gurdjieff was influenced by many people during his life (some of them are mentioned in his book Meetings with Remarkable Men), but his earliest influence, according to him, was his father, a carpenter and a bardic poet. In his teenage days, Gurdjieff read a lot of scientific books. The knowledge that he acquired, combined with the unexplainable things he was witnessing, led him to believe that there is an ultimate truth hidden somewhere out of the reach of conventional science and religion. HIghly motivated to find this truth, young Gurdjieff set out on a journey around the world. He visited places that are known for holding ancient knowledge, countries such as Iran, India, Tibet, Egypt, and Italy. He then returned to Russia, keeping to himself a lot of the knowledge he’d acquired on his journey. 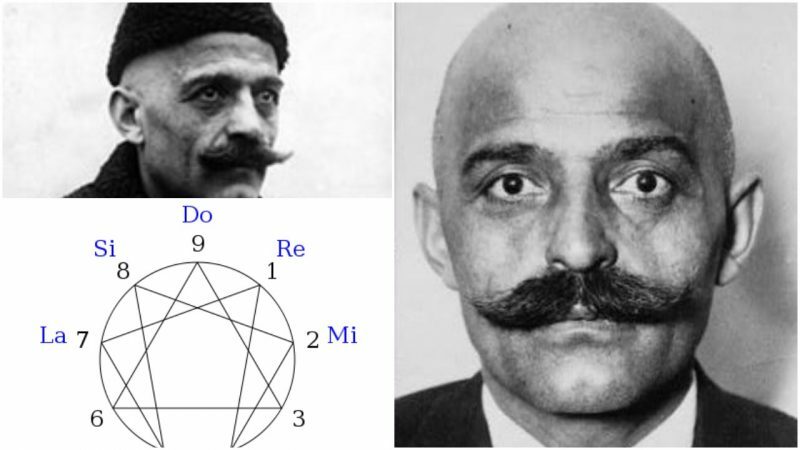 Besides searching for the secrets of a balanced life, some of Gurdjieff’s friends claim that he was also involved in “the Great Game,” a political conflict between the British and the Russian empire over claims on Afghanistan and a few other Central and Southern Asian regions. 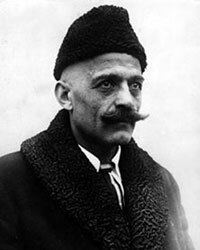 Gurdjieff arrived in Moscow on New Year’s Eve in 1912, full of enthusiasm and ideas. He met with his cousin and famous sculptor, Sergey Merkurov, and introduced him to his thoughts on a new way of “spiritual” teaching. Merkurov, together with the eccentric Russian mathematician and esotericist P. D. Ouspensky and composer Thomas de Hartmann (the author of the music for Wassily Kandinsky’s The Yellow Sound), became Gurdjieff’s first disciples. Ouspensky would become Gurdjieff’s close friend, and he would later form his own philosophical system based on Gurdjieff’s teachings. By 1916 he had about 30 students, and he was ready to start off with teaching his philosophical system that was to become known as “the Fourth Way.” Initially, this system was complicated, and Gurdjieff often explained it by using various scientific terms. So what was the Fourth Way all about? Well, according to Gurdjieff, we as human beings aren’t looking at the true reality, in the condition that we are generally in–that is, a dreamlike state, a constant “waking sleep,” as he called it. We all look at the things that surround us in a subjective way. Gurdjieff claimed that through proper direction and “education,” a person could get out of the loop of subjectivity, and evolve to look at the world more openly and clearly, to view it as a whole. Gurdjieff considered that there are three segments of our personality: the emotional part, the physical part, and the mind. He explained that the focus is put on only one of these segments in the classical schools or religious sects. Because of this, the “student” is left with the other two “centers” undeveloped. Another thing that bothered him was the fact that if a person decided to grow spiritually in one of the three main traditional ways, what he called “the path of the fakir, the path of the monk, and the path of the yogi,” that person was supposed to isolate himself from the rest of the world. After failing to find a teaching system, or spiritual path, that implemented all the segments that make us human, Gurdjieff created his own, and he named it the Fourth Way. This complex system took elements from many different religious schools such as Sufism, Tibetan Buddhism, Eastern Christianity, Zoroaster, and from various sects such as Indian yogis. He started his first Institute for the Harmonious Development of Man in 1919, in Tbilisi, Georgia. When working on his system, Gurdjieff had in mind the inhabitants of modern Europe and the United States. He considered these societies as furthest from a unified consciousness because of the tempo and manner of their modern way of life. Through his teachings, he offered them a way of developing and integrating all three segments: emotion, body, and mind. 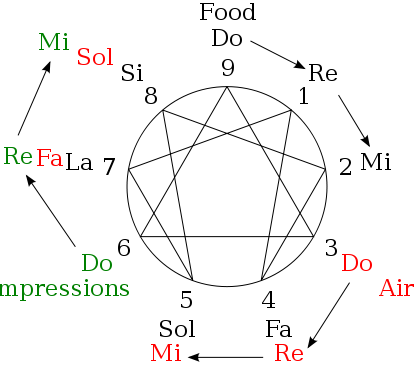 Enneagram with point numbers and octave designations for octave beginning at point 9. Points 3 and 6 show “shock points” at which a new Do may enter and develop alongside the existing octave. As one of the first modern “gurus,” Gurdjieff offered his students a path to enlightenment through various different practices, which he called “the Work” or “Work on oneself.” He always said that the hardest thing is to decide to work on yourself and change, while the second step, the work itself, is much easier. Gurdjieff based his courses on three basic methods: music, movement, and writings. Through these three basic elements and in combination, he wanted to bring about a change in behavior patterns and motivate his students to take a deeper look inside their souls. 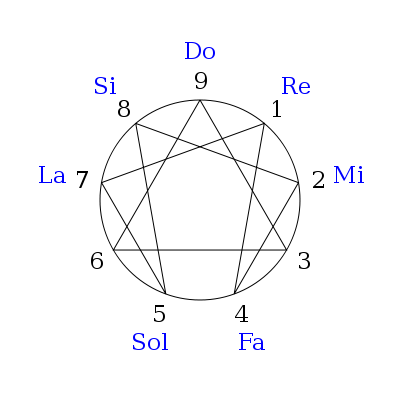 The music of the Fourth Way is divided into three periods. The first was mostly music created by Gurdjieff himself: the composing for his ballet called Struggle of the Magicians, and some music pieces for his so-called Fourth Way Movements. The second period, which became his most famous, is more structured and created with the help of Thomas de Hartmann. These compositions, which also became part of the Fourth Way Movements, were made during the mid-1920s, when Gurdjieff and his group of students worked in the Institute for the Harmonious Development of Man close to Paris (Prieuré des Basses Loges in Avon). The second period was rich with sounds from Caucasian and Central Asian folk and spiritual music. It also contained elements of Orthodox liturgical music and is close to what we call “world music” today. The third period consisted of improvisations that Gurdjieff used to perform in his Paris apartment during the occupation of Paris during World War II, until his death in 1949. The second method of Gurdjieff’s teachings were the movements, which he also called sacred dances. These were a combination of many different dances from around the world, traditional as well as spiritual, such as elements of the dance of the whirling dervishes. Gurdjieff was really fond of the dancing element of his system, and he often called himself a “teacher of dancing.” For those who want to see how the movement choreographies looked, there is one shown in Peter Brook’s biographical movie about the life of Gurdjieff, Meetings with Remarkable Men. The last method, the writings, consisted of his students reading Gurdjieff’s philosophical trilogy, All and Everything. The first part, which is huge, is called Beelzebub’s Tales to His Grandson. In it, in a partly fictional narrative form, he explained the laws of the universe and the nature of human beings through the character of Beelzebub as he talks with his grandson. This is the basis for Gurdjieff’s philosophy of life and the starting point for understanding the Fourth Way. 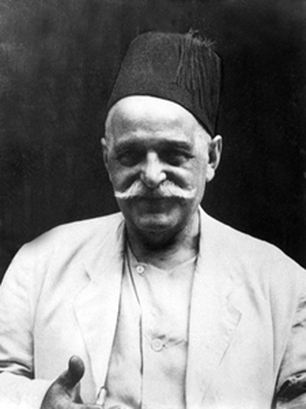 Later in his life, after moving to Paris, Gurdjieff changed his ways of teaching. His methods became weaker and not so focused. In his apartment, he used to organize dinners and hold drunken parties during which he made “toasts to idiots.” He became unpredictable and based his lectures on anecdotes, jokes, and simple proverbs. He also insisted his students read his book Beelzebub’s Tales up to three times if they could. 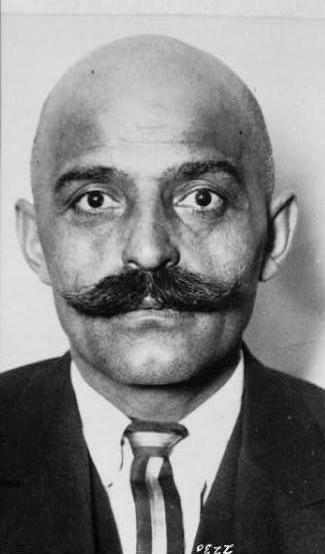 Although his system and spiritual school declined, Gurdjieff was still a good and charitable person who was able help the people in need during the war. Because of this, he was imprisoned by the Nazis for short time. Following a guru, or anybody that claims that he can get you on the right path of life, is not without its risks, but there is one thing that we can learn from Gurdjieff’s teachings: among all the different schools of thought and belief systems, it is really important to look to ourselves and choose our own path. It is important to stay balanced in order to tackle and surmount every obstacle on the road called life.